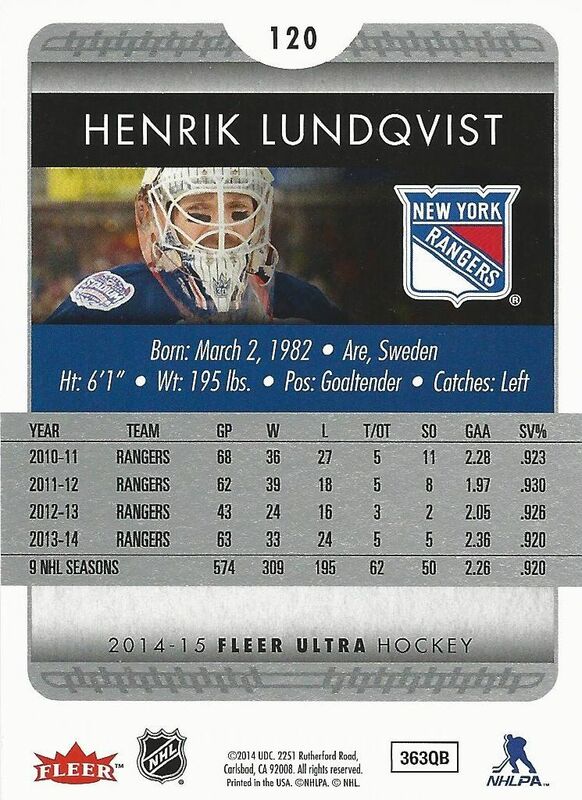 It's been a few years, but Upper Deck re-introduces Fleer Ultra into their hockey card line-up. Ultra is a brand that has been around for a very long time. It started off as a premium card product, but now sits as one of the lower-end brands. Ultra entices collectors with interesting insert cards rather than through hits. 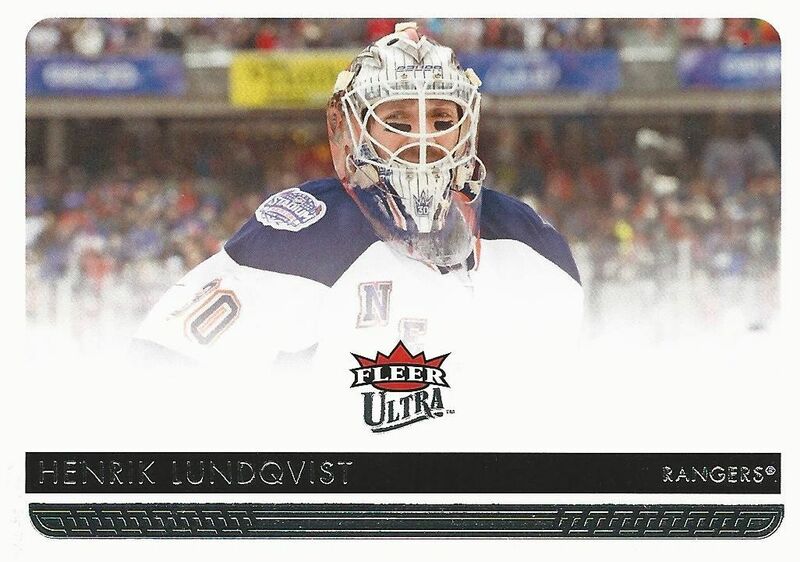 Let's see how Ultra looks in its return to hockey cards. Ultra base cards were once super-glossy full of pop. This iteration of the brand is much more subdued. These base cards come framed with a white border and minimalistic graphical design elements. I've always thought that a plain white border makes cards feel lower-end, and that's the case here. There just isn't anything on the card that makes you go 'wow'! Sure, it's a very clean looking card, but it's not overly modern and it's not fun design either. It's just a no-nonsense base card that isn't that won't be too memorable in the long-run. 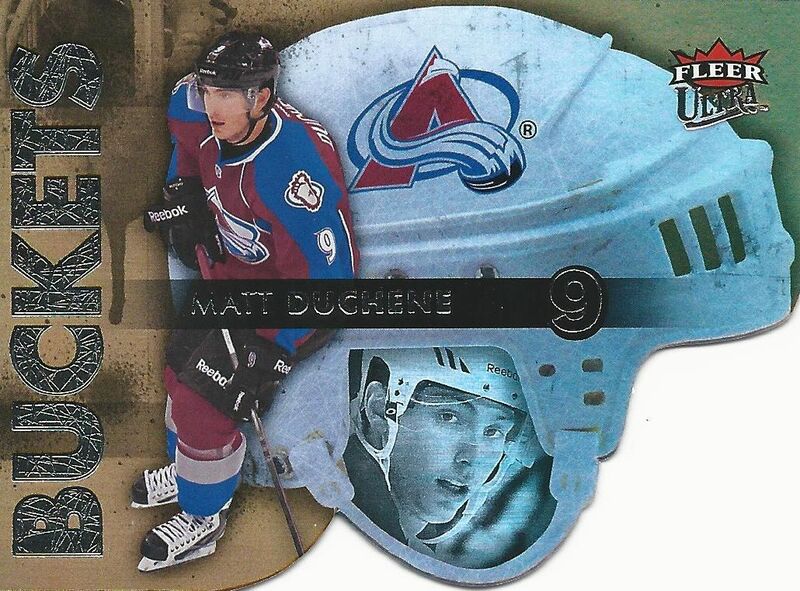 I really wish Upper Deck had chosen to go with a design that would stand out more. This year's Ultra is just too tame. The Ultra card backs are pretty standard for a product in this price range. I appreciate that they are full-color, but there is not player write-up for a collector to read. For lower-end cards, the write-up is important because the cards are affordable to younger collectors who may want to learn more about their favorite players. I wanted to point out that there are base card variations in the set of Ultra this year. I tried looking for information about these alternate base cards, but couldn't find any. 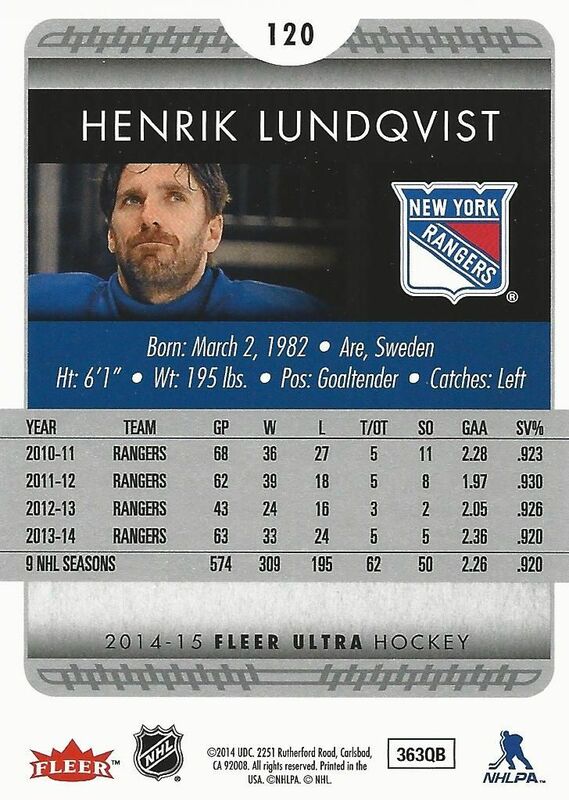 Here is the same Lundqvist card but with a photo of him at the Winter Classic. It makes me wonder if these cards are pretty rare or if they are common variations. As you can see, the back has the same numbering but the photo matches up with the photo from the front. 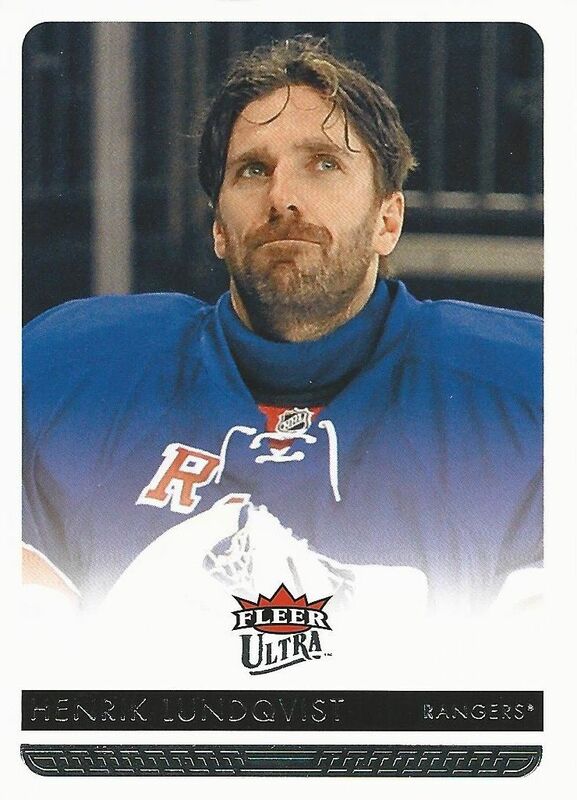 I wonder if we'll hear anything about these alternate photo cards from Upper Deck in the near future. I hope we do! 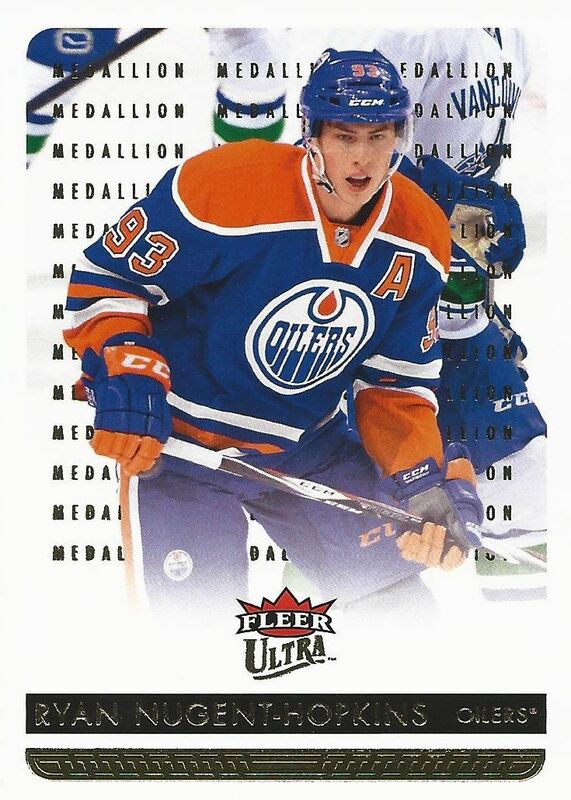 Like O-Pee-Chee before it, Ultra is a brand that makes it difficult to pull hits as they are not guaranteed per box. What you do get, however, is a pretty big collection of insert cards - much like the Ultra of the past. Upper Deck is banking on the power of unique insert cards to make Ultra go. Will collectors go for it? We'll just have to see. 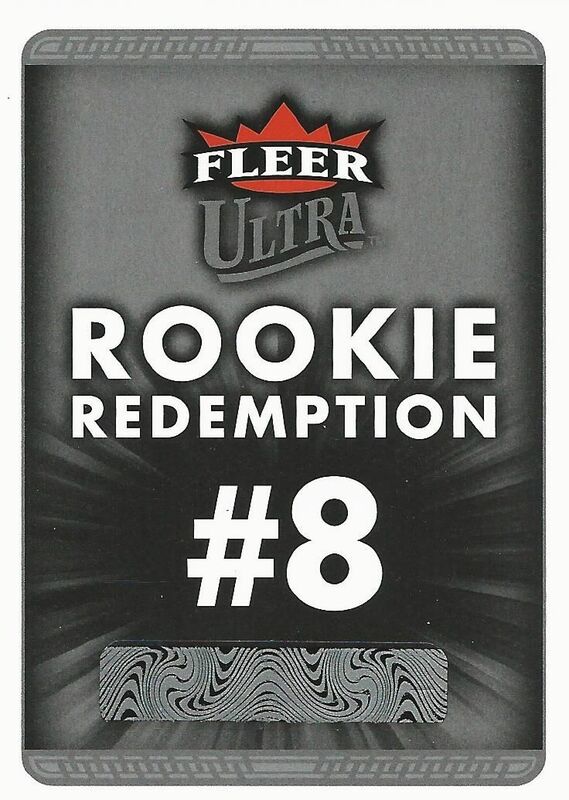 Because Ultra released before the start of the hockey season, Upper Deck has chosen to use redemptions as a means of getting Ultra rookie cards out to collectors. These redemption cards come about one per box, so they are not too difficult to get. 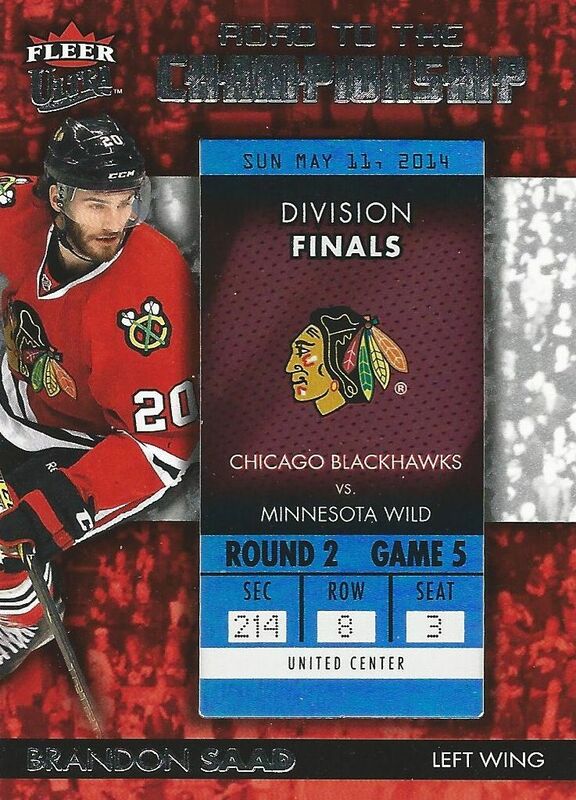 Road to the Championship insert cards have embedded replica tickets in them. It's an interesting concept to document all the playoff games from the last season, but the look of these cards reminds me of Panini's Playoff Contenders set. Surprisingly, the back of the card congratulates the collector who gets it of receiving a replica ticket. I'm not sure it's that special! Photo Vault cards showcase a photo that hasn't been seen before previous to this release. I guess Upper Deck has dug deep in their vaults to find images that collectors get to see for the first time. These inserts are pretty good looking, and I think the design has been executed well. Autographed variations of these cards exist and are numbered to just 10. The Buckets insert set has foil and die-cutting. This set celebrates the often uncelebrated piece of equipment that is the helmet. Is this a novel new idea or is Upper Deck just reaching on this one? I'm leaning towards the latter. Still, the set is very unique and I'm not sure I've seen anything quite like it. Foil and die-cutting are also used with the Gongshow Grinders set. 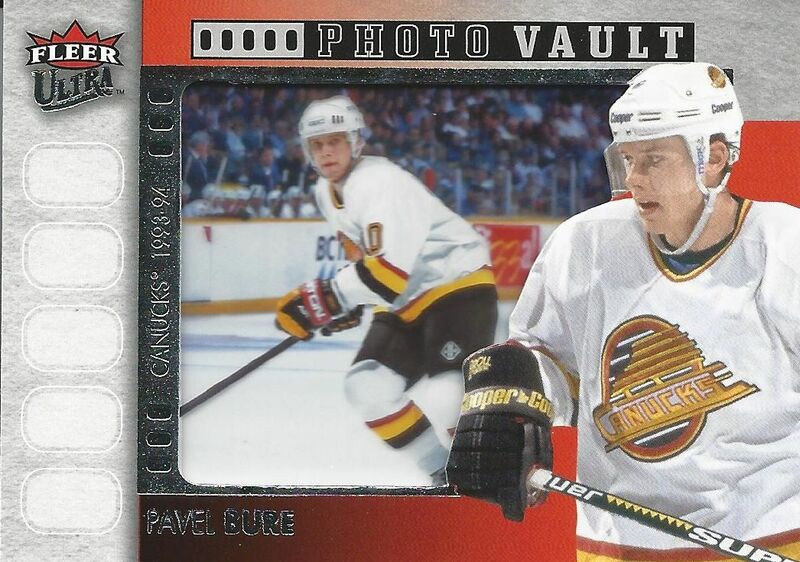 This insert set focuses on the NHL's toughest players. Again, it's a unique idea... not a new one... but one that isn't done too often, so I commend Upper Deck for putting in this set. 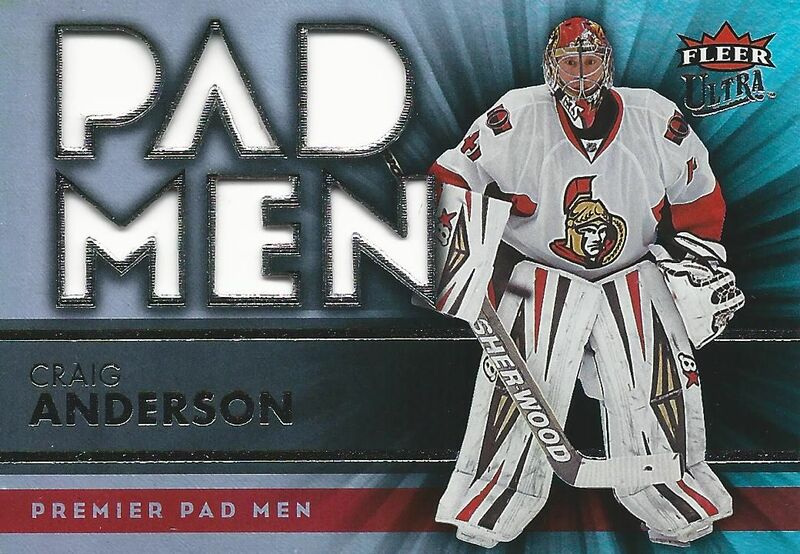 When I got this Craig Anderson Pad Men insert card I thought I had a jersey card on my hands. The decoy card was behind this insert so it looked like the letters were jersey pieces. Unfortunately, they weren't - it's just empty holes! That was a little disappointing. On the positive side, the card is good looking and pretty different for an Upper Deck design. Gold Medallion cards make their return to the set, and it shouldn't be a surprise. 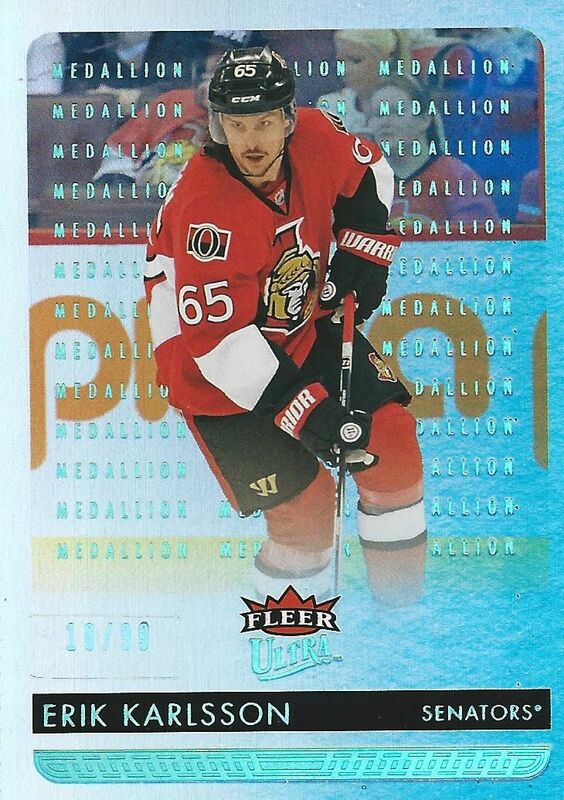 Gold Medallion parallels have been in Ultra for years. This year, rather than making the entire card gold foil like they've done before, the word 'Medallion' is placed all over the background of the card. All foil Platinum Medallions are numbered to 99. These cards have a great shimmer to them, and I can see collectors enjoying the look of these. Rookie redemption Gold and Platinum Medallion cards are available, but they are very difficult pulls. Some boxes of Ultra will have a special bonus pack containing EX2014 cards, and I was lucky enough to get one. The EX cards look amazing. The design is top notch, and I'd happily enjoy having a set of these. EX cards have always looked great, and this new version of them continues to impress. I have fond memories of EX, and collectors who enjoyed them in the past will definitely like them this year. The EX packs contain special inserts as well. 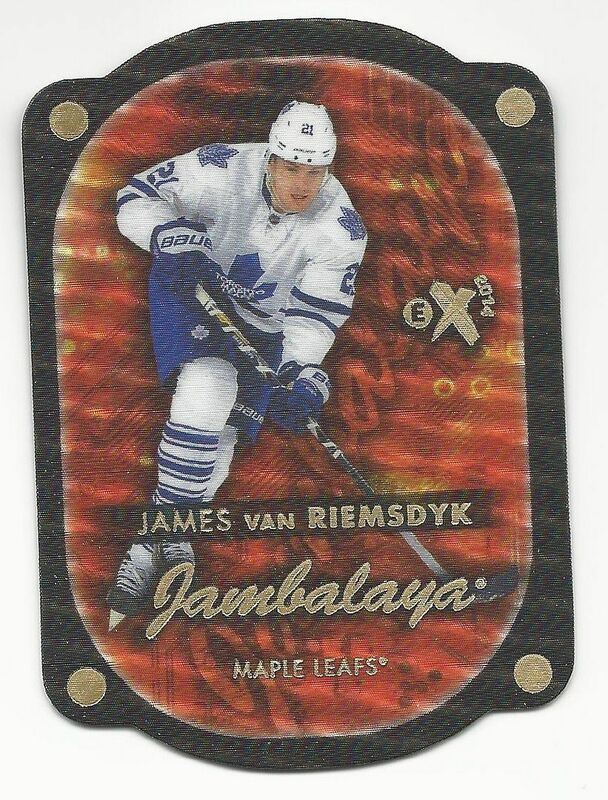 This JVR Jambalaya card came with mine. Jambalaya inserts have been popular in other sports - most notably basketball. It's a unique card that immediate stands out as something special. I wish I pulled a National Heroes flag card from my box - I love the look of flags on cards, but none came in this one. I also missed out on an autographed card, but that's a pretty tough pull out of Ultra this year. If you're looking at Ultra, you've just gotta think insert cards. Though Ultra doesn't really have any hits (except for the very difficult variety), I really enjoyed breaking this box. Getting all the cool looking inserts was a joy. Collectors nowadays may not appreciate these types of cards as much as they did in the past - and that's too bad. The cards look great and are fun to find when ripping through packs. I'd say that younger collectors and collectors looking for a unique break can look to Ultra. It will definitely provide some fun. If you're looking for monster hits and guaranteed jerseys or autos, you'd better look elsewhere. I personally hope Ultra does well and that Upper Deck finds some magic with the inserts in Ultra, but it's really up to collectors to determine how much they like it. Ultra is a good product that provides a whole lot of fun on the cheaper end of the hobby spectrum. Im so happy that they brought back Ultra !!! I don't like the desing of the base but all those insert were sick. I like the fact that they add that bonus who gives you 3 inserts ! 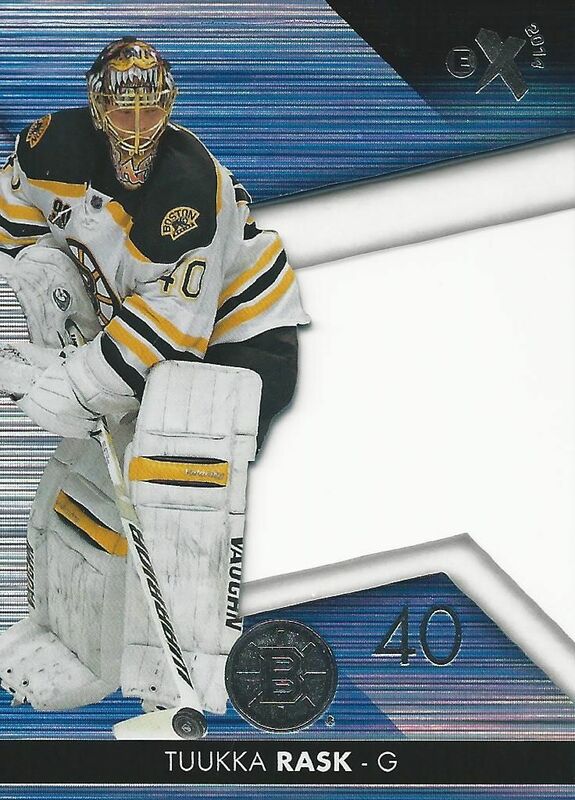 Is it really a good design scheme to have holes all over a subset that features goalies? This fell a little flat to me. The base design is plain the die cut's don't fit with the set to me and most importantly there was no hit in the box which is usually a staple in this product. At least a hit per box would be nice! Liking the inserts in this. I will have to get me a box soon. I am not a fan of the base card design but the inserts really save that product in my opinion. I heard that the bonus packs are 1:4. + You can get unique insert cards! + The EX pack. That set should've been a product by itself. - The base cards feel very low end, and I'm not a fan of the white border at all. - The Gold Medallion set doesn't feel special. I don't like the concept just spelling out "Medallion" in the background. I really like the ultra cards this year and I really love the JVR card cuz I am a big fan of JVR.!!!!! Yeah the product is a bit of a try-hard... Great review though! Nice break and great in-depth review! Awesome opening with yakupov and a rookie redemption!